Discussion in 'News & Updates' started by Cipher, Feb 8, 2017. JackArrow, Vigor, Slazzy and 5 others like this. Imported a lot of new tiles, backgrounds and objects into map.wz (for later use I swear). Free Market Entrance - Has been given a wedding themed facelift to celebrate the launch of Weddings. Free market 1-6 - Each map has been given a different theme based on new and existing tilesets, for fun. Fixed the mini invisible ladder than somehow appeared after the recent update to the map, you should no longer get stuck on the last ladder as a result of this. Red Tulip and Red Rose have been made one of a kind. Naricain Demon Elexirs now stack to 100 instead of 10. Lunchbox is no longer one of a kind. Valentine's Day Chocolate description changed to: A sweet treat sent by someone special! Changed the name to Somersault kick. Improved MaxHP's description now more accurately reflects how you gain extra HP. Added a line about reduced damage to multiple targets. Changed Magic and Weapon att to Magic and Weapon Def, you should no longer be lied to by the skill description. Added that the 5th and 6th hit deals 200% and 400% additional damage. JackArrow, Vigor, foobaka and 2 others like this. The Patcher is now to be intended as a Game Launcher. Now available both for .NET 4.0 (Windows XP) and 4.5 users. [.NET 4.5 only] If updates to existing .wz files are available, the Launcher will now only download the file differences instead of redownloading the whole file. 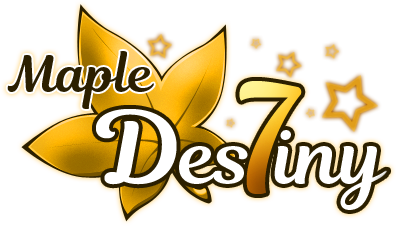 The Launcher will run Maple Destiny via "MapleDestiny.dll". The updating process will download it automatically. Added popups for some features (like Launcher closing). These can be disabled by the user. Tentative fix for the self-updating feature. Might require more work. The Quest.wz switching feature isn't working yet. Some fonts and styles are missing (displayed as default fonts). User settings currently don't save/persist. JackArrow, Nagami, Slazzy and 1 other person like this.